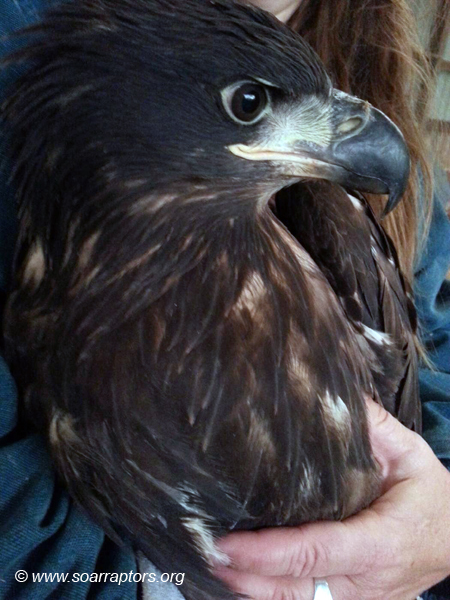 Kay has received official word from US Fish and Wildlife Service (USFWS) that the 22 June 2014 juvenile eagle admitted from Decorah, IA / Winneshiek County is no longer being held under Kay’s federal rehabilitation permit, this juvenile eagle has been transferred to Kay’s Live Eagle Exhibition Permit! Decorah will be his name! Now Kay will begin his formal training needed to be an education ambassador on the fist and bow perch. Kay will need to get leather anklets and jesses for him and attach. (Look at photos of Thora to see her leather jesses.) Once “jessed up,” then Kay will start fist-training. Before Decorah is ready to carry out his duties as an education ambassador for SOAR, he will need to be comfortable sitting on Kay’s fist, learn to step to her fist, to the perch, and back, plus he will need practice going in and out of his travel crate! Decorah needs practice sitting on a bow perch (this is what you see Thora sitting on in photos). Once Decorah is comfortable with these tasks, then typical distractions will slowly be introduced to simulate what may happen at a program. That’s a great deal of adjustment. There is no set timeline for these activities… how quickly Decorah responds and gains comfort will be the determining factor on training progression. This isn’t a one-week course… this is an open-ended course that requires much consistent work. USFWS recommends that persons working with a live education eagle gain 500 hours of experience working with eagles over two years. This experience is to include handling an eagle, caring and feeding eagles, captive husbandry techniques (perching, jessing, housing requirements), and medical management. At this time, Kay will be the only educator working with Decorah. Other educators may work with Decorah in the future or may assist Kay with programs. What training activities are needed for both the ambassador-in-training (AIT) and the educator? 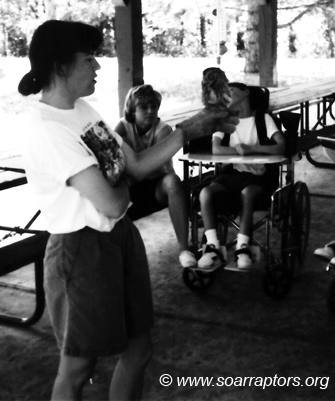 Linette and Scruffy the screech owl, spring 1992 (I think) with students from an Ames school. New educators (an apprentice) need to work with an experienced educator like SOAR’s executive director (the sponsor). Educators first working with an education bird start small! Screech owls and American kestrels are the species that an apprentice can work with. The apprentice needs to learn about natural history, medical management, and programming information on raptors. In addition, the apprentice must spend time with the sponsor learning the fine points of having that bird sit on the fist, how to handle the situation when the bird bates (falconry term meaning attempting to fly when secured to a fist or perch), and how to keep the stress level down for the bird. The educator also needs to learn the individual behavior of each bird they work with, to learn their individual tolerance and/or needs. Some days will be good days, others may not, some education birds may not be bothered by wiggly, giggly preschoolers, some may not tolerate being outside on windy days, some may not do well if used in programming for several days in a row. Each education bird should be well “manned” or trained before it is used in active programming. “Manning” is a falconry term meaning the process of conditioning raptors for handling. This might be first simply sitting with the AIT in their mews. Mews is another falconry term describing the structure or room where the raptor lives. Once the AIT is fitted for anklets and jesses, the educator can practice with the AIT to quietly step from the perch to the fist. Much time will be spent with the educator having the AIT on the fist sitting, walking, going through doorways, hearing sounds, seeing objects moving, going in and out of the travel box, and in and out of the mews. With approval of the sponsor and likely additional training, the educator may start working with medium and large size raptors.